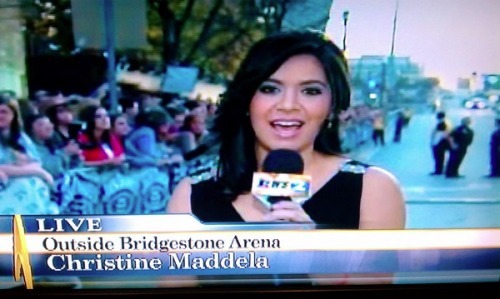 Christine Maddela (Twitter: @christnemaddela) is the News2 Weekend anchor/reporter at WKRN. She is Nashville's first Hispanic anchor of an English-language news broadcast. Maddela won Best Local Twitter Feed (TV) in the 2009 "Best of Nashville" edition of the Nashville Scene. The accolade is well-earned; she uses the abbreviated social media tool not only for the "official business" of reporting but also keeps a conversation going during the breaks in her broadcasts. Maddela welcomes and responds to her Twitter followers, who send her comments that alternate between mundane observations and flirtatious admiration, but Maddela takes it all in stride. Maddela was named Best TV News Anchor by the Tennessee Associated Press in 2008 and won another TN AP award that year, as well as an Emmy nomination, for "The Border" - a three part series documenting the illegal immigration issue from several different points of view. Maddela's report "Appalachia" - about poverty and drug abuse in Kentucky's rural Appalachian Mountains - also earned her an Emmy nomination. Maddela moved to Music City from the CBS affiliate in El Paso, Texas, where her reports on immigration and border issues drew national attention and accolades. Before working in El Paso, Christine worked as a correspondent in Washington, D.C. She graduated from the University of Missouri-Columbia School of Journalism with a Bachelor's of Journalism and a double minor in political science and Spanish. Maddela grew up in Denver, Colorado. Her mother is Spanish and Filipina. The Maddelas are Spaniards who were part of the Spanish colonization of the Philippines. That’s what brought them to the Philippines. There’s actually a small town in the Philippines called Maddela where one of my great grandfathers served as governor. My mother came to the US after college. It was a “who you know” kinda thing. Her uncle is a former Philippine ambassador who pulled strings. After she married my father, they moved to Denver for work- following my dad’s job. This profile of Christine Maddela is the sixth in a series of media profiles here on HispanicNashville.com. Others recently featured include Chris Echegaray of the Tennessean, Charles Maldonado of the City Paper and Scene, Marielena Ramos of NewsChannel 5 Plus, Amy Napier-Viteri of WKRN/News2, and Eric Alvarado of Fox17. On deck are Ray Ponce de Leon of The Contributor, Jaci Velasquez of 94FM The Fish, and Phil Castillo of the One Nation Under God show on SuperTalk 99.7 WTN.